On October 31st 2016 Geoff Graham completed 60 years as a member of Durham ARC with a small celebration in the clubhouse. As an oarsman he achieved success winning the Lady Herschel Plate for Novice coxed fours at Durham Regatta in 1963 and the Rushworth and Storey Cup for coxed fours in 1966, then, rowing as a pair with Bill Parker, winning the MacFarlane-Grieve Cup for senior pairs in 1968. The Boston Marathon provided further notable successes including winning the pair in 1971 and 1973, and in 1974 being a member of the overall winning crew, a coxless four of GS Graham, WT Parker, J Hedley and JC Kenyon, then winning the fastest 8+ in 1975. As club captain in 1982 he was able to report a then club record of 62 wins in open events, a total surpassed the following year with 72 wins thanks to a strong junior contingent. Eleven of these wins went to the ladies coxed four coached by Geoff, with a crew of A Lund, A Page, C Fraser, A Dawson and cox Tommy Maddison, including gold medals representing England at the Home International in Glasgow. In recent times there has been much success with the women’s performance squad including Gill Prescott and Helen McMillan. This entry was posted in Club News, Uncategorized on October 31, 2016 by Colin Lawson. The 2016 Scottish Indoor Rowing Championships took place on Saturday, 29th October at Bellahouston Sports Centre, Glasgow, where Roger Stainforth competed in and won the age 70+ 1000m race in a time of 3m:28.2s. Later in the day he went on to race over 2k in the open heavyweight category in a time of 7m:26.6s. This entry was posted in Racing News on October 31, 2016 by Colin Lawson. Entries for Durham Autumn Small Boats Head are now closed. The draw will be published on or after October 31st. This entry was posted in Expired Announcements on October 28, 2016 by Colin Lawson. This weekend Gill Prescott will become the first representative of the Club to take part in the prestigious Head of the Charles Regatta (HOCR), the world’s largest invitation rowing event with over 9000 rowers participating, and the largest spectator event of its kind with attendances of up to 500,000 over 2 days of competition. Held each October the HOCR takes place on the Charles River which divides Boston and Cambridge, Massachusetts. With the full spectrum of ages and every boat class represented it attracts competitors of the highest calibre from across the globe. This year is the 52nd time the regatta has been staged over the iconic 3-mile course. Gill has been invited to join members of Long Beach Rowing Association in California to form a crew for the Directors’ Challenge Women’s Quad Sculls on Sunday. Coverage of crews passing Cambridge Boat Club and the Eliot Bridge is available on The Rowing Channel (bow 12 in Directors Challenge is at the end of the first section of footage at approx 59 mins) with the remainder of the event continuing here. The Long Beach quad of Gill Prescott, Antonella Corazza, Helen Frykman and Sherri Kline finished in second place in the Directors’ Challenge posting a masters adjusted time of 19.06.106 (raw time 19.49.106). This entry was posted in Racing News on October 17, 2016 by Colin Lawson. This entry was posted in Club News on October 16, 2016 by Colin Lawson. Glorious autumn sunshine welcomed 120 competing crews to Cambois Rowing Club on the River Wansbeck on October 1st for the first of 6 rounds of the Long Distance Sculling Series. There were wins over the 3350 metre time trial course for Durham ARC crews in the J17 and Women’s Masters D coxless quads and for Andy Jaggard in Masters F and Joyce Collett in Women’s Masters G single sculls. The Series has been very popular in recent years with scullers from all clubs in the Northern region, and this year is no exception. Organised by the Northern Rowing Council a round is staged each Saturday during October at Wansbeck, Tees, Berwick, Tyne and South Hylton, with the final round taking place at Durham on November 5th. Courses range in distance from 1800 metres to 5000 metres. Last week’s event at Tees produced another win for Joyce in her Masters single and for the Women’s quad with a different line-up this time competing as Masters C, as well as for Kim Forster and David Muse in the Mixed IM3 double. By entering several events members can gain points for their club which count towards Victor Ludorum awards for Juniors, Seniors and Masters which are presented at the end of the Series. In addition to the Long Distance Sculling races several clubs stage a Small Boats Head on the same day, providing another opportunity to race over the same course in a different crew and this time including sweep-oar options. The J15 girls entered two coxed quads for the Wansbeck Small Boats Head and finished in first and second places. There were wins in the Tees Small Boats Head for Clare Woodward in the Women’s Masters D single scull and for the Masters D double of John Lyons and Richard Court. Further details can be found on the Northern Rowing website. This entry was posted in Racing News, Uncategorized on October 12, 2016 by Colin Lawson. The eighth and final round of the 2016 Explore Series took place at Durham ARC on October 2nd with 12 crews in competition for points in 24 side by side sweep-oar races over a 300 metre course. The weather stayed fine and three crews, two from Durham ARC and one from Tyne ARC, finished with a maximum haul of 4 wins each. 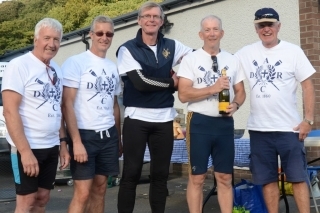 This season, the fifth of the competition that began life as the Sunday League, proved to be the most successful yet for DARC crews, who took first and second places in the Women’s league and second in the Open league. In winning the Women’s competition DARC Green claimed the Club’s first ever overall series victory. Second placed Wear Here have been strong challengers throughout the season, emphasising the consistent performance of the club’s women’s squad at this level. Not to be outdone Wear Past It also claimed second spot in the Open league, 2 points behind the winning entry Fog on the Tyne from Tyne ARC. Colin Percy presented trophies and prizes on behalf of organisers the Northern Rowing Council to the winners and runners-up. Teams are allowed to draw on a maximum of 6 members per season, who have to hold novice status at the time of entry. Representing DARC Green (pictured top) were Jan Halford, Linda Forwood, Kate Wicks, Julie Kitson, Aisling Dutton and Paddy Deans. Wear Here included Kalpana Ganatra, Sue Lyons, Jane Auster, Lesley Wilkinson, Margaret Richardson and Leigh Bowron, with Dave Green, Chris Merchant, Vaughan Gordon, Colin Lawson and Stephen Auster making up Wear Past It. The competition was introduced in 2012 to offer competition for novice, recreational, and returning rowers and retired racers. Before the start of racing there was a special presentation to James Andrews of British Rowing who has overseen the competition since its inception but is now moving on to take up a new position. With ever-evolving rules this year saw a record number of 28 open teams and 18 women’s contesting the series. The league table, background information about the competition and archives for each year can be found on the Northern Rowing website. Photos from Durham are on the DARC facebook page. This entry was posted in Racing News on October 10, 2016 by Colin Lawson. On Saturday October 1st a group of Old Salopians who where at Shrewsbury School with Bill Grant gathered to launch a Hudson Double scull named in memory of Bill and bought with money donated by the group. The double will be used by the school’s Junior girls. 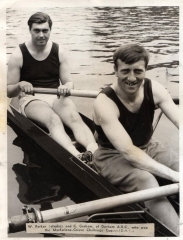 Unfortunately the weather was not kind but his old mates went out in the rain in a double and quadruple sculls to row past the school boathouse in his memory. After the row past the boat was christened by Jenny Grant, Bill’s widow and a few memories of Bill were shared with the gathering. He was well respected in the school community. 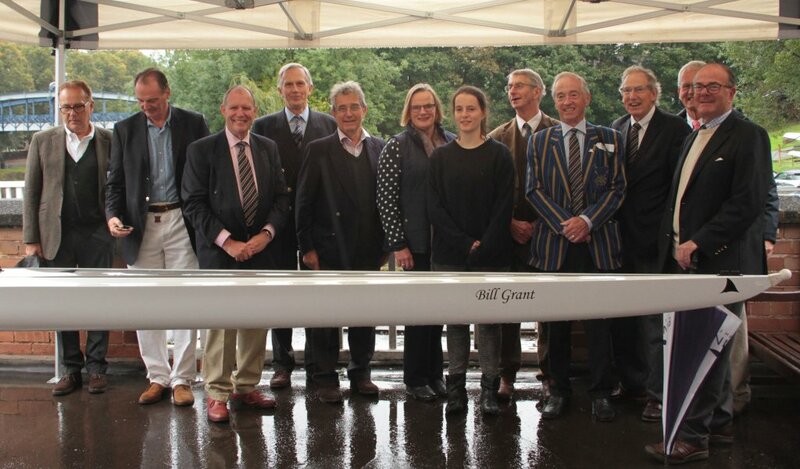 Bill started rowing at Shrewsbury School in the 1960s before a successful rowing career with Durham University. After a break of many years he returned to coaching at Durham ARC some 10 years ago and served the club in many roles until his death in 2015. The Old Salopian newsletter contains an obituary on page 76. This entry was posted in Club News on October 6, 2016 by Colin Lawson. On September 24th in Newquay, Cornwall two DARC members, Hazel and Roger Stainforth were in world record setting indoor rowing activities in their respective age groups. Organised by the Newquay Indoor Rowing Club, two teams of rowers from across the UK – and one man from France – set world records rowing in relay fashion to complete 100km on Concept 2 rowing machines. Each team member rowed for 200m or 20 strokes at their maximum pace before passing the handle to the next team member, so the action was continuous. Hazel competed in a 60+ mixed team comprising 6 women and 3 men. They chose to row 200m sessions and, despite having to change rowing machines twice in the course of their 100km which they achieved with Grand Prix style efficiency, still managed to set a creditable record time of 6h 13m 48.0s. Roger’s 8-man 70+ team had no equipment failure dramas. They chose 20 strokes, and settled into a remarkably consistent pattern of 1320m per rotation in setting a record time of 5h 49m 50.2s. By the end of the row each team member had rowed for 77 sessions. For the statisticians they on average covered a distance of 162 metres at 35 strokes per minute. The average pace was 1 minute 44.9 seconds for every 500 metres. 70+ team members: Tommy Gee, John Gibbins, Peter Jones, Tony Lorrimer, Chris Marrow, Tim Sherriff, Roger Stainforth, Tom Yule. There was no resting on her laurels for Hazel. After a journey from Cornwall home to Durham it was off to Glasgow to run in the Great Scottish Run half marathon on Sunday, 2 October. Accompanied by son, Richard, a former DARC member, she ran a commendable 2h 09m in her first half marathon. “The conditions were perfect but the last 2km were really hard. Perhaps the 100km relay wasn’t the best preparation but I wouldn’t have missed either”, a tired but very happy Hazel smiled. The prospectus for Durham Autumn Small Boats Head is available here. This entry was posted in Expired Announcements on October 5, 2016 by Colin Lawson.